We have recently made a change to the mobile app that requires installing it fresh. If you have last year’s app, please uninstall it as it may conflict with the new app. Have no fear, last year’s content will be available in the new install. 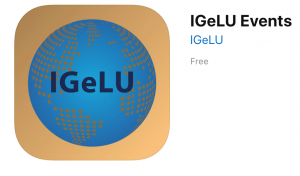 The IGeLU 2018 mobile app is ready for download. Create your personalized schedule, search for sessions and speakers, give us feedback and more! To download and install the App for your Android or iOS device search your App store for “IGeLU events”. This logo should appear. Download and install the App. On opening the App, you will be asked to download “IGeLU 2018”, which will install this annual conference’s App. You also have access to last year’s content too. Want to use a browser version? When using the App or browser version Login is required. You are prompted to enter your First Name and Last Name details. This is checked to the conference registration and a verification code will be send to your email address. Each time you log out and login again, a verification code will be send. The App synchronizes on multiple devices based on your account. Let us know your User eXperience! Please use the session rating options and the Conference Survey the App offers. We value your feedback to improve the quality of our annual conference. The App is our main source for gathering feedback. Here’s a sneak look at the app ! More information on how the app can be used can be found under “App Info” . Happy Exploring !